The fan design of the TY-150, which is based on the TY-147, has been further improved. Due to its larger diameter it meets the desire of users to realise the greatest possible air flow rate at the lowest possible noise level. True to its motto "innovated - not imitated" Thermalright is constantly striving to develop new products or to further optimise already known models. 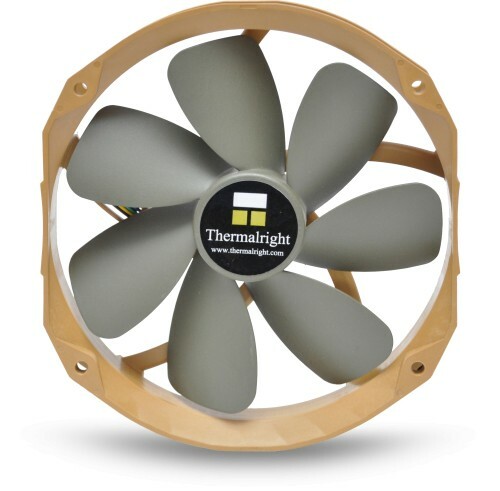 Following this motto, the TY 150 is an innovative fan, which has been primarily developed as an upgrade for Thermalright cooler. The new fan provides a powerful alternative to the proven 140 mm fans of the TY-series. The TY 150 has a speed range of 500-1,100 rpm and thus moves it even further in the low speed range (TY 147: 900-1300 rpm) - at the same time the maximum capacity is improved to nearly 84.2 CFM (TY 147: 73.6 CFM) while the maximum fan speed is reduced by some 200 rpm. The TY-150 provides an optimisation of the two key facts, due to its revised specifications: The fan on the one hand has a lower minimum speed and offers on the other hand at its maximum (now lower) speed a significantly higher air flow rate. Even at the minimum speed of 500 rpm the TY 150 provides a high flow rate of just under 38.2 CFM (TY 147: 56.6.CFM at 900 rpm). Since the fan is primarily designed as an upgrade for existing Thermalright cooler, the TY 150 comes with a pair of matching fan brackets for the following Thermalright coolers: HR-02 Macho, Macho PCGH, Archon SB-E X2, True Spirit 140 BW and Silver Arrow SB-E. The new design of the TY 150 produces a higher air flow rate than all other fans for CPU cooler currently on the market at identical speeds. This applies both for the minimum fan speed and the maximum speed. In conjunction with the optimised wings and streamlined framework a particularly effective and also very quiet air flow is realised. The TY 150 is equipped with seven fan blades in the revised "torpedo" style. The bearing of the fan axis has been adjusted to the increased mechanical loading by the greater impeller - accordingly the TY 150 sports a double ball bearing. The monitoring & control of the fan speed is done automatically by the motherboard (PWM), the fan thus provides a particularly sensitive and uniform speed adjustment. Please note that the mounting points of the fan are not arranged in a square and the TY 150 thus is not universally applicable. The dimension is 125 x 105 mm - the TY 150 is designed primarily as an upgrade option for current Thermalright coolers.